in the end, it all came down to three eggs, cracked on the rim of a bowl, shells the color of cafe au lait cast in the sink, so many empty-hulled shards. 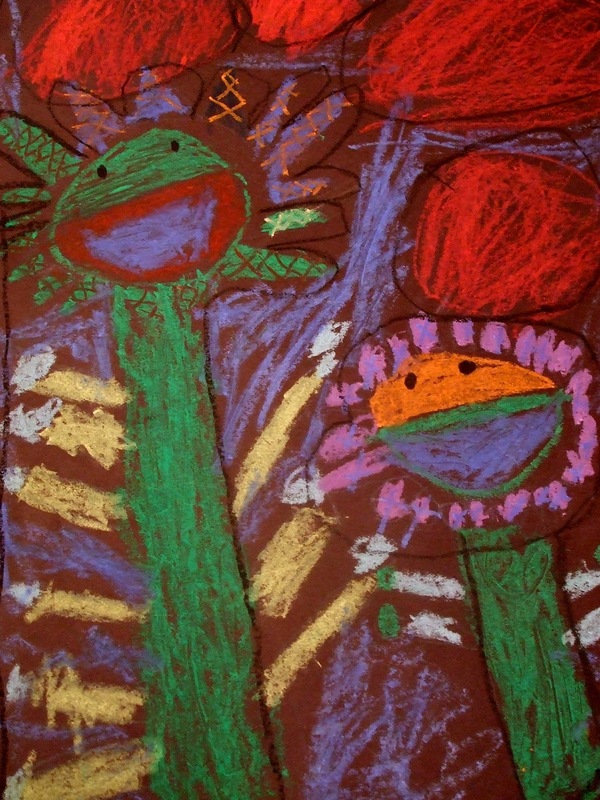 it’s all i could do here at the end, at the start of the final exams, as the boy who i love inhaled a few last lines of latin declensions, read back over ovid, gathered his pencils and sighed. all i could do was stand there stirring, and praying. 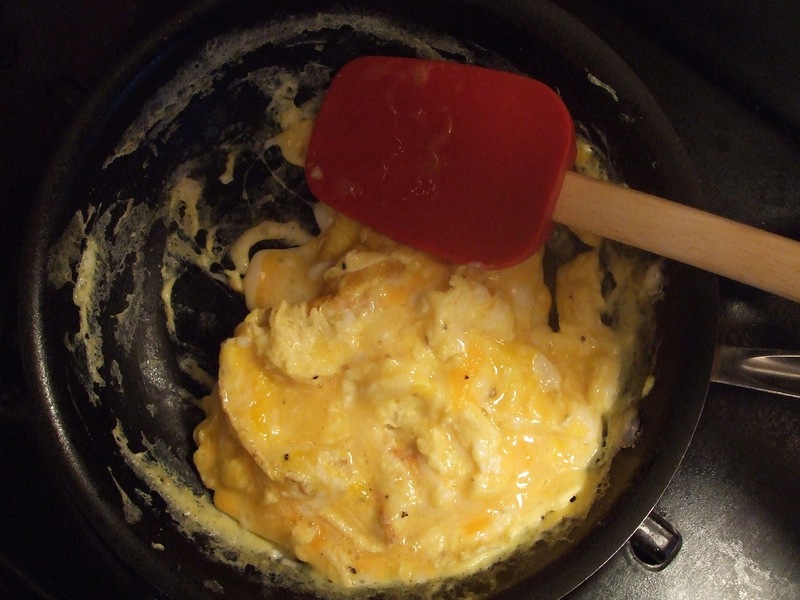 watching the yolks turn creamy and hard, pile high into egg drifts. i imagined the protein, the strands in the eggs, bolstering all the cells in his brain. i stirred and constructed the scaffold, the brace that would hold up his thought, streamline the answers, hurdle him straight to the finish. it’s all a mama can do sometimes. stand there and stir, and spiral her prayers. “channel grandpa geno,” i told him, as i sprinkled cheese in the eggs. “he was a wizard in latin. “and, remember, this is your national language,” i added, a feeble attempt to lighten the moment, to wedge in a sunbeam of humor, one that drew on his old catholic roots. and then for a moment, i clung to that thought of my papa, saw him again in my head, vivid and clear and in color: his irish face round, decidedly rosy, his eyes atwinkle as always. i imagined him, an apparition of comfort and joy, see-through and floating, just over the desk of my young latin scholar. i’d grown up with stories of how my papa, time after time, saved my uncle’s behind and his grade point average, besides. how, under the strict gaze of the jesuits, he’d managed to lift the edge of his test, so from the seat just behind and across, my uncle could peer at the answers. i imagined my papa doing the same for my firstborn, the grandson he never knew, though over the years i’ve offered him up, made him a part of the canon of story. made sure through the power of word that one knew the other. my firstborn, in fact, can reel off tales of his grandpa. and i can picture my papa beaming, bellowing, at the antics and charms of my firstborn, the one with the mind so much like his grandpa’s. it’s all a mama can do at the dawn of the year’s final passage: beckon the spirits, call on the clan. all the while stirring the eggs. it’s time now to let loose of the worries. time now to lean into faith, and the soft chest of my papa. it’s time to believe in the power of mind and of prayer. it’s time now to rinse our hands of this year. to bid it goodbye and good riddance. all we can do here at the end is serve up the eggs and the vespers. as i scraped out the pan, buttered the toast, i realized this was the last. next year, there will be no end-of-the-year finals. and the year after that, when he’s somewhere at college, i won’t be there to stir–at least not the yolks of the eggs. but wherever he is, wherever i stir, the prayers will always continue. and as long as i breathe, i’ll channel his grandpa. for just such a classical challenge and triumph. antibiotics are one thing. they work, as i’ve seen zillions of times, when your throat is raw as if sandpaper-rubbed. they manage to quash all sorts of bugs. the ones that bring fevers deep in the night, the ones that make bones feel practically poisoned, what with all of the aching and all of the shaking. oh, they might come in horse-pill dimensions. or in thick goopy glop that your children must swallow, after they’ve scared you with all of their gagging. unfortunately, all of life’s pains are not the bacterial kind. every once in a while the wallop is brought by nerves that are shot. so tired. so spent. so flat-out-of-steam. it’s been one of those weeks around here. make that, one of those months. oh, go wild, call it one of those schoolyears. in simple declarative terms it is this: junior year of high school, at Big Pressure High, when the course load is thick, is intense, is wholly immense. without spelling out the hair-pulling moments, without counting off the nights without sleep, let’s assume for the sake of discussion that there have been plenty of both. heck, whole pyrenees ranges, stretching clear to barcelona. and as i sit here typing, i have reason to think that phase one of the torture might just have lurched to a close. a young lad i happen to know, one 6-2 and counting, he is, at this very hour, lifting the flap on his messenger sack, extracting 12 pages of thesis from there in the depths, and plopping said load on the desk of his teacher. no more worrying about that. the junior theme, now typed, paper-clipped, bibliographed, is checked off the life list. and so, people, we inch our aching, tired, slumping mortal frames into recovery phase. there is only so much of a siege that one little house can endure. and the typing all night seems to have hushed. i hear only the sound of my keys, the ones at the ends of my bone-tired fingers. there’s nary an echo from that room up above. how then does one begin to salve the worn-ragged nerves of a parental unit (a pair of those, thanks be to God) now spiraling down from highest alert? one begins, i suppose, by emergency airlift to the grocery store. who let the milk jug run dry? and where is the bread to smear with the butter that’s nowhere in sight? why, lordy, this cottage has gone to the dogs. everywhere i look i see blackened nibs of eraser. crumpled up bundles of paper. the evidence of a house stumbling through finals. no, wait, the finals aren’t yet. that’s phase two of the torture. but for now, for this one brief moment in time, we are here at the end of our rope. ooops, i mean, grind. the agony is, for the weekend at least, temporarily lifted. and i’ve 48 hours to pull it together. to fill up the fridge. to soak in the tub. to indulge in the alka-seltzer fizz that comes with returning to normal. take a deep breath, dears. the task that’s upon me, you see, is to prop myself up like a couch pillow, one that’s been thumped with a fist. i need here some restorative tricks. the emotional equivalent of a russian masseuse to bang on my door and order me down on the rug. i’ll begin, i suppose, by sticking my nose in the lilacs. my dear blessed mother, she left me a jar by the sink. she’d gotten a call from deep in my darkest hour. when i was nearly at wit’s end with this paper that would not get done, and the distress was starting to steam from the holes in my ears. she did what mamas do: she listened, and hmmm’d, she attempted to soothe. 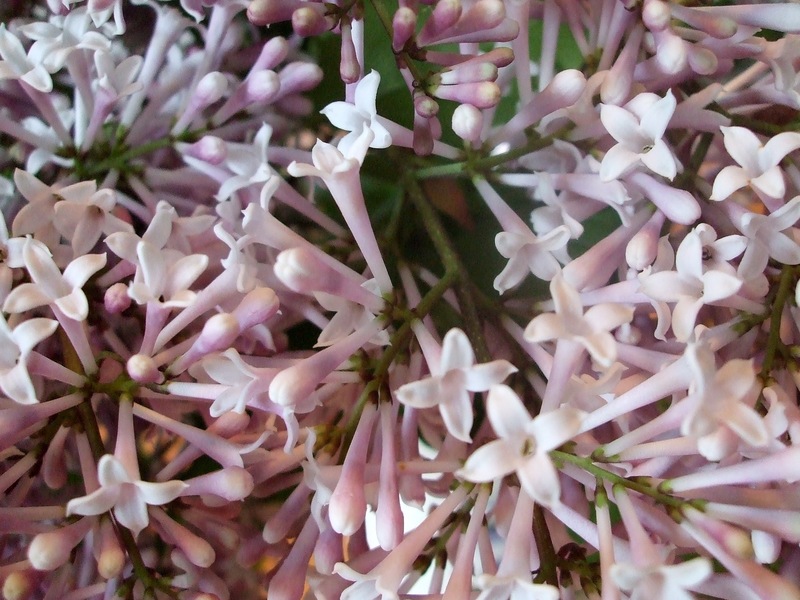 then she went to her yard and snipped off the necks of an armload of lilac. perhaps, like the nosegays of victorian times, the ones whose primary purpose was eclipsing the bodily odors, i ought to pin on a clump, somewhere up by my collar. perhaps a walking stalk of lilac would keep me from feeling so woozy. and perhaps after that i’ll head out for some trowel therapy. that always works, to dig in the mud. and today, with the rain, it is muddy. the ooze might do me some good. a tall mug of soup would be fine. one that’s laced with herbs from my garden. the chives at the moment are wholly in bloom, and carry a stiffening bite. a trip to the farmer’s market is surely on the docket. as is a sacred shabbat after sundown, and a whole afternoon to prepare. i am blessed, utterly, truly, to have at my reach a whole apothecary of emotional fixes and soothers of nerves. i do believe that what’s ordered is a day of whispering quiet. i will tick through my thanks for getting at last to this day, one circled in red on my calendar. and as i wrap my tired aching self in a blanket of vespers i will putter around, putting myself back together again. so that when monday rolls around, i’ll be primed for the slam of phase two, the torture continues. what are the fix-its that line the shelf of your emotional apothecary? what do you do to recover from an overdose of stress, and too many sleepless nights? as often happens around here, i was neck-deep in writing, pounding away on the keyboard, sweat beads practically pouring, i was thinking so hard. wrestling sentences into their pens, trying to catch wayward thoughts, haul them back from the pasture. that’s when the knock came. actually, it was the second knock. i’d typed through the first, wholly escaped it. at last, as the rap grew bolder, more insistent, i finally connected, realized the banging on glass was a knock on the door. someone, apparently, wanted to chat. either that, or a stranger needed to borrow the salle de bain, to powder her nose before ambling along. so up from my chair i stumbled. nearly tripped on the rug (writing intensely is dangerous business, do not believe otherwise, people…). as i rounded the bend i saw not a magazine peddler, nor a sharpener of knives. no, no. twas my dear beloved garden archangel, my beautiful neighbor who lives in her garden clogs, 24-7, who forever is wearing her gardener’s kneepads, who’s never met a puddle of mud she wasn’t apt to sink, swim or splash in. she works in her beds for hours on end, humming along as she hoes, i assure you. has a sweet little pug, a doglet named raisin, (here’s a marvelous thing, a tangent of course, but what beauty is life if not for the tangents we take: ol’ raisin? her middle name, truly, is ettes. raisin ettes. get it?). raisin, whose legs are maybe two inches long, and whose belly circumference might be, oh, 24 inches, making her decidedly a walking defiance of gravity, she is the official garden dog of the ‘hood. she is adept, really, at tiptoeing around the delicate things. never once have i seen her squish a tender stem, or flatten a bloom with her bum. i don’t believe she’s yet learned to fetch whatever it is that her archangel needs, but i’m sure she’s practicing madly. the thing about raisin is, she needs breaks. she cannot be expected to dig up bare roots, lounge in the daisies for hours on end. she needs to exercise those wee little leg muscles. she needs to waddle. so, not only is her archangel a master of her own garden, she keeps a close eye on everyone else’s. and so it was that while i sat feverishly typing, pounding out vowels, reaching for consonants, the archangel of gardens discovered something magnificent right under my nose. once i got to the door where she paced, i knew right away there was news. perhaps another house had been tumbled, i suddenly feared (they seem to be felled with alarming rapidity). perhaps her petunias were deep under water (the rains poured mercilessly night before last, burying this fine little burg in gallons and gallons–whole hectares–of water). 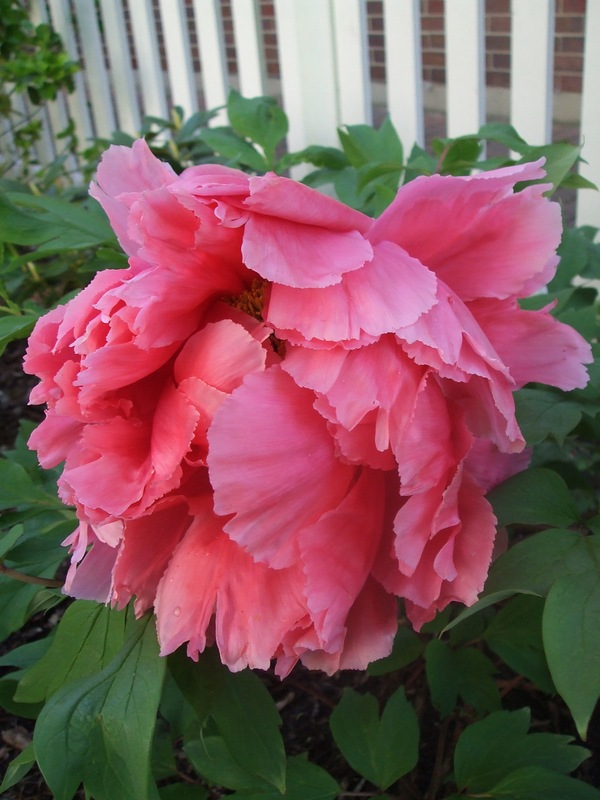 as i opened the door, she began: “have you seen your tree peony?,” she practically shouted. i had no clue it was out there. last time i’d paid attention, the darn thing was merely a bud. a fat one perhaps. a swollen one. but hardly a bloom to pull folks in off the sidewalk. apparently, in the thick of the rains, it did what blooms do: it unfolded, eased back its brilliant pink-flamingo petals, gulped heartily of the drink from the skies. it wasn’t shy. didn’t cower under the rainclouds. it bloomed, hallelujah. put on its own personal fourth-of-july pyrotechnics. (never mind that it was the 13th of may). and i, intent on making sense of a story. intent on cleaning the kitchen, getting the kiddies straight out the door and onto the schoolbus, i’d missed it completely. made me wonder, as i tiptoed back out later last night, under the light from the porch and the very few moonbeams that poked through the clouds, as i studied the crepe-paper crinkle of each of those sumptuous petals, as i marveled at petticoat-ruffle-upon-petticoat-ruffle (no quinceanera ballgown, the ones in lollipop colors that hang in the shop windows and beckon young girls in from the sidewalk, has ever equaled the volumes of ruffly fluff), it all made me wonder just how often i miss the beauty right under my nose? how can something so short-lived, something so utterly breath-taking, be so veryclose, but not noticed? are we typing too madly? are we missing the prize that quietly blooms, right under our gaze? yesterday, were it not for the knock at the door, were it not for my blessed archangel of garden, i’d have missed the beautiful. i’d have missed the holy. i am haunted, and slowed, by the peony that nearly exploded and shriveled and vanished, before i’d paid one ounce of attention. what beauties have you missed of late? what tales of narrow escape have you to tell here? do you have an archangel who taps at your door, reminds you to notice the beautiful?